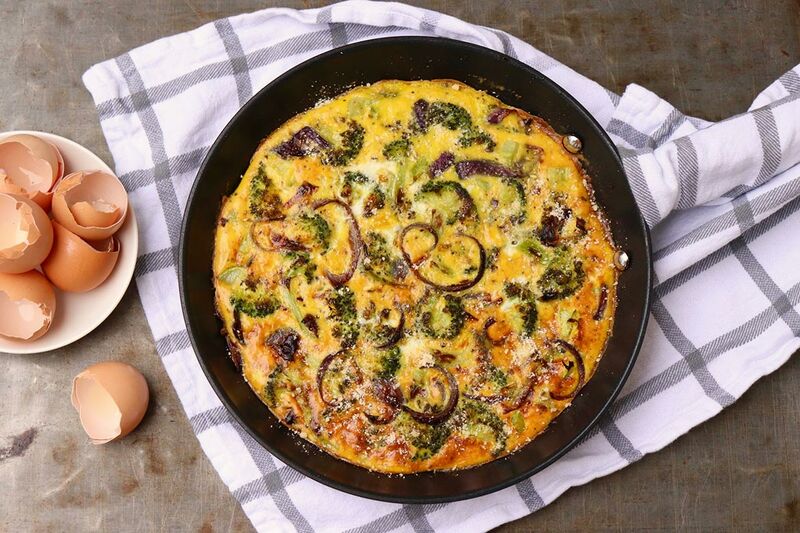 Creamy eggs meet caramelized veggies in this Slow-Baked Roasted Broccoli Frittata for a flavor-packed meatless meal that satisfies any time of day! When preparing a frittata, I generally lean towards adding some form of meat. A small amount of bacon, ham, or prosciutto ratchets up the flavor quite nicely. 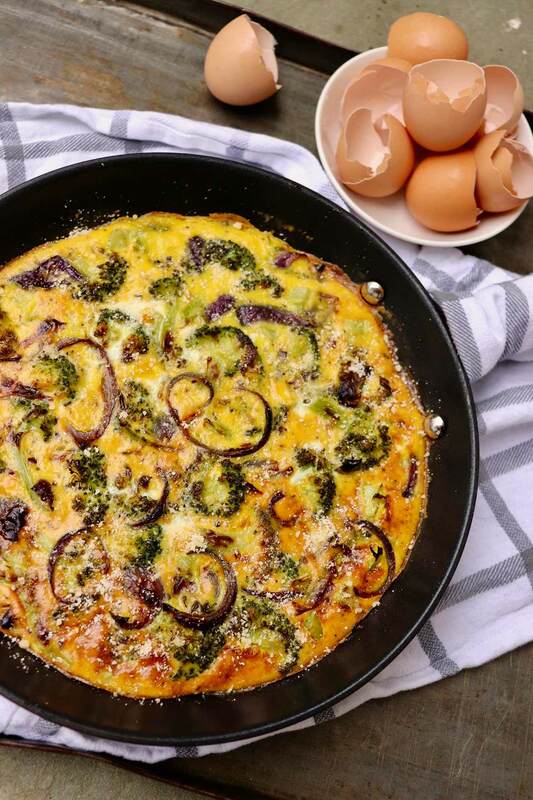 Recently, however, I’ve been returning to this slow-baked roasted broccoli frittata over and over—and there isn’t a speck of crisp bacon in the equation. 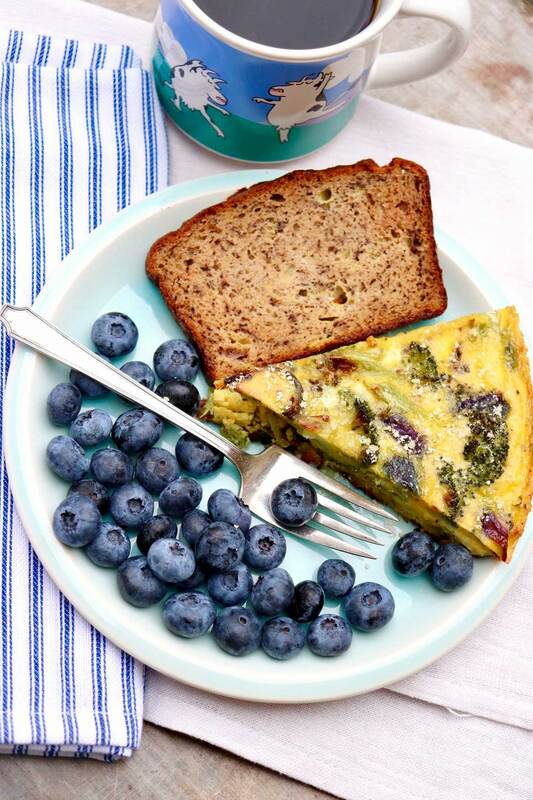 To what does this meatless frittata owe its delightful flavor, you may ask? Roasting the broccoli and red onions intensifies their flavor and creates irresistible umami, making this meatless meal especially satisfying. I’ve always been a fan of roasted broccoli, but the red onions are the pièce de résistance in this case. A hint of char and a light caramelization brings out a delightful sweetness that shines through the base of eggs. Reducing the oven heat (after roasting the vegetables) for the sake of cooking the actual frittata yields eggs that are slightly creamier than the typical frittata. It also minimizes the chance of overcooking the eggs. For ease of preparation without sacrificing flavor (perhaps adding some! ), I streamlined and lightened Andrew Feinberg’s, chef/owner of two Brooklyn restaurants, original recipe. He likes to finish with a squeeze of lemon, which you may do if you wish! Because the veggies are roasted first (an extra step, of course, but mostly hands off and so worth it), the broccoli crowns become lightly charred while the red onions caramelize and sweeten. As much as I love a hint of smoky bacon or shards of ham speckling my frittatas, this is one rendition in which I do not miss them at all. I’ve also been known to go a tad heavy on said vegetables so that they protrude slightly from the uncooked egg mixture. This poses no problem when the frittata goes back in the oven, so rest easy if you do the same. 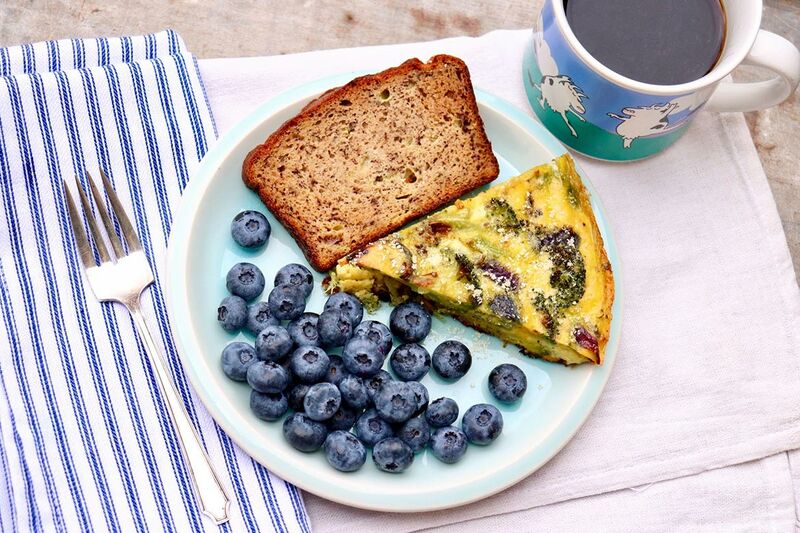 My perfect breakfast is a wedge of this frittata, a slice of Paleo banana bread (sweetened with bananas only!–recipe forthcoming), and a generous serving of berries. It offers variety and great taste while being healthy and filling–and everything can be prepped ahead. 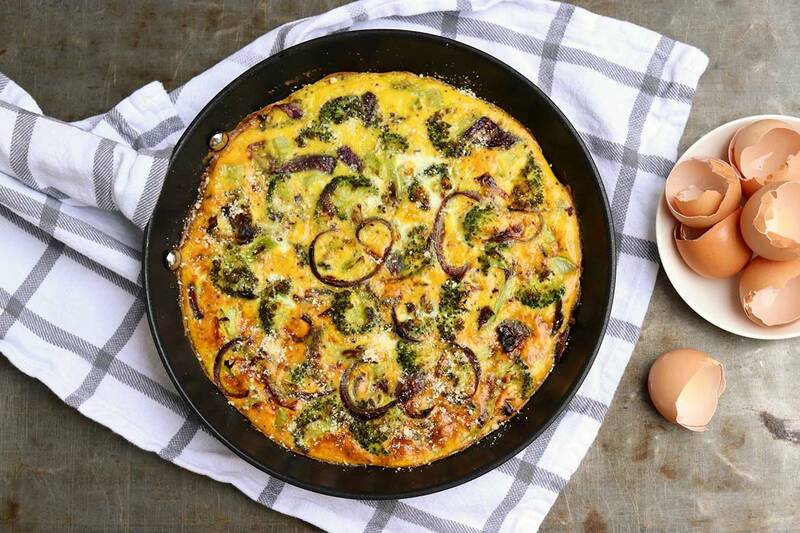 When enjoyed this way, I often get eight slices out of the frittata (as opposed to the more conservative six servings listed in the recipe), making breakfast for several days depending on how many others are eating it, too. Alternatively, the frittata can be served with a green salad and crusty roll for a light but satisfying dinner. Creamy eggs meet caramelized veggies for a flavor-packed meatless meal that satisfies any time of day! Preheat the oven to 425° F, and lightly grease or line a large, rimmed baking sheet with parchment paper. Crack the eggs into a medium bowl and whisk together with the Parmesan, 1 teaspoon kosher salt and black pepper. Set aside. Transfer the veggies to the prepared baking sheet, spreading into an even layer. Roast for 15-20 minutes or until the stems are just tender and the tips of the broccoli are golden brown. Remove from the oven, set aside, and reduce the oven temperature to 300° F.
Heat the remaining tablespoon of oil in an oven-safe 10- to 11-inch sauté pan or skillet set over medium heat, and add the garlic and chile. Cook for a minute or until aromatic, watching closely so as not to burn the garlic. Add the roasted veggies to the pan and mix well. Add the egg and cheese mixture, using a fork or spatula to evenly distribute the vegetables. (It’s ok if the some of the broccoli and onions stick out.) Increase the heat to high and cook for 30 seconds. Transfer the pan to the 300° F oven and cook until the eggs are just set, about 25 minutes, give or take a few. (Start checking after 20 minutes.) Remove from the oven sprinkle with additional Parmesan cheese, if desired. If you like a golden brown top, you can broil for a minute or two at the end, watching very closely. In this case, you’ll want to switch to the broil setting just before the eggs are done to prevent overcooking and maintain best texture. 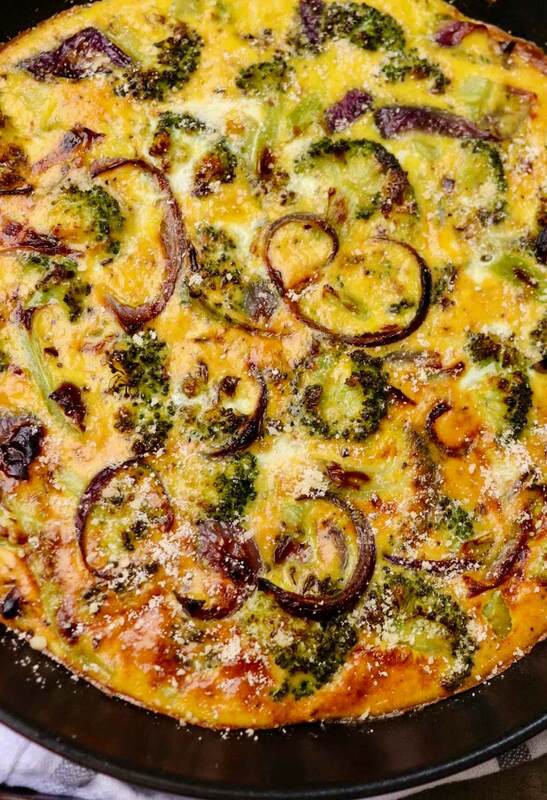 We like zucchini frittatas, all cooked in same pan on stove top. Onions are carmelized and then removed from pan. Then zucchini is cooked until soft. Onions are returned to pan and 4-5 eggs that are scrambled are added over the zucchini/ onion mixture with some salt and pepper to taste.It is cooked over medium-low heat until done to our liking. When zukes and tomatoes are in the garden, this makes a wonderful summertime dinner with sliced tomatoes. Thanks for taking a moment to share one of your favorites, Helen. It does sound like a delightful summertime meal!